Kartik Wahi, Founder of Claro Energy is an electrical engineer and a management professional. In an interview with BK Jha, he talks about challenges and prospects of solar pumps solutions. 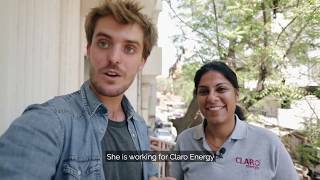 Claro Energy was founded by you and two of your friends. You were deeply into corporate world. What inspired the trio to join hands to take up entrepreneurship and travel into unexplored territory? We were keen on identifying under-served markets and making a breakthrough. One day, we were discussing many ideas over coffee and that’s how we stumbled upon clean energy, which was a theme in vogue both in US and India. But that’s where the similarities end. In the US, the efforts of reducing carbon footprint is driving solar whereas in India, it is inadequate access to energy that is forcing our population to rely on diesel, and that’s the reason we entered into this segment. Initially, we faced many hardships and fundraising was the most crucial part. But we had a clear roadmap. After intense research of 7-8 months, we decided to be in the clean energy space. When we started, ‘solar pumping’ was non-existent and a solution based on it was a remote possibility. Finally, our determination and passion to transform paid dividends. After industry and corporate exposure, we had decided to be on our own. We found India a land of huge opportunities. Lack of efficiency was the main bottleneck. There was a need to bridge this gap in efficiency. Challenges were many. First of all, the solar irrigation system was non-existent here, so adoption took time. Moreover, these innovative solutions were to be installed with the partnership of the state governments. Finally, we needed human resources or skilled manpower to sustain the system. Awareness is the key. We have ‘Claro Mitras’ who guides the farmers about the solutions and make them aware about the benefits. It is double whammy that the government is paying subsidies on conventional fuels and electricity to the farmers, however, the potential of renewable energy is not being tapped fully. We are in talks with banks, sugar mills and others for last-mile logistics. In the long term, once we build the capacity, low cost would be a realty. What are main benefits of Solar Pumps? How is your solution novel? We install solar pumps ranging from 1 HP to 10 HP, operating on AC and DC, which can be installed on the surface as well as are submersible. A 2 HP pump set will cost a farmer about Rs 2,00,000, allowing him to water his five-acre land. If he goes the traditional route of relying on diesel, he will be spending Rs 70,000 on an average per annum. If he invests in solar, he can recover the costs in two – three years. Farmers who have installed solar pumps three years ago are now moving from staple crops to high-yielding ones such as mushrooms and bananas, to name a few. Some have even started fisheries in their lands. So, from selling staple crops at a rock-bottom price to eke out a living, they are now making profits. Power is finally in the farmers’ hands. How has been progress so far in terms of revenue ? In 2016-17, the company’s turnover increased to Rs 35 crore and now we have an order book of Rs 135 crore. Some projects will take time to be fully implemented; however, we are hopeful to touch Rs 60 crore turnover in the current fiscal year. Claro Energy has four different models to suit the financial capabilities of its customers: subsidy-supported, lease, bank-funding and pay-as-you-go model. Claro Energy is working in several states? Are you looking for other geographies? Presently we are working in 16 states and have over 100 employees. In Bihar, Uttar Pradesh and Madhya Pradesh, we have installed over 1,000 units. It has nearly 2,000 projects on the ground, which are cumulatively benefiting over 10,000 farmer families. Additionally, there are over 2, 000 solar pump projects under execution. We are eyeing at other geographies too. We are moving to African countries. In fact, International Solar Alliance (ISA) has issued a line of credit worth USD 2 billion ( Rs 13,000 crore) for solar pumps installations in African countries. USAID also provided USD 0.5 million as grants to expand our innovative business model for irrigation.